Reloading 300 Blackout is fun, easy and enjoyable. 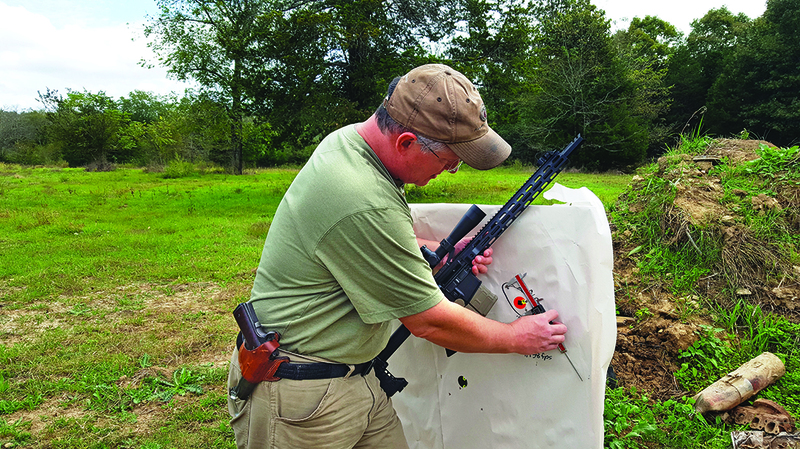 Here, Jay Langston tests multiple loads in a couple of different ARs. J.D. 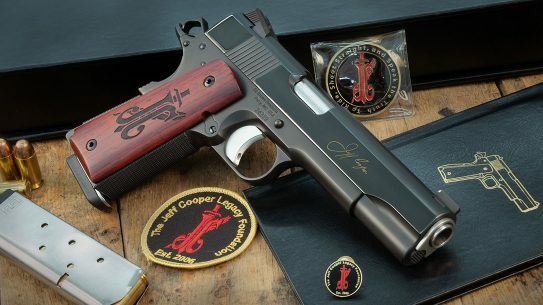 Jones’ 300 Whisper got things started commercially years ago for today’s 300 AAC Blackout fans. Both cartridges are cross compatible in new chambers, but don’t try reformed military brass in a tight, old Whisper chamber. 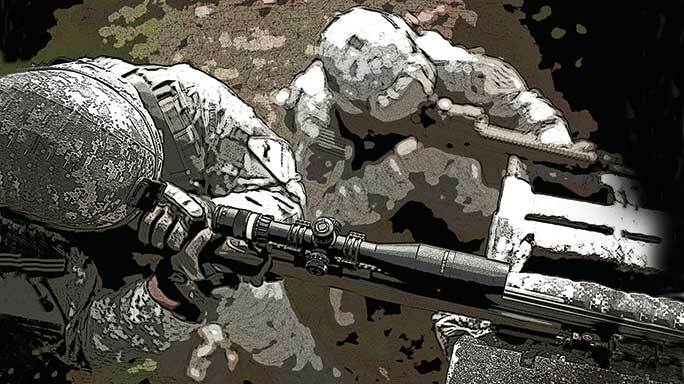 This Loki Weapons System’s accuracy is due in part to a cut-rifling Satern barrel, which likes both A1680 and H110 powders with a wide array of bullets. 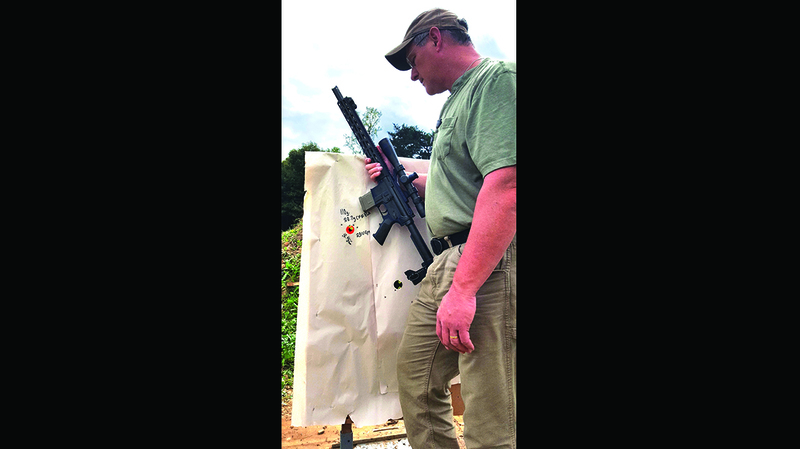 The author checks out the results of paper punching with 300 BLK-chambered DoubleStar AR topped with a Leupold Mark IV 3.5-10X optic. 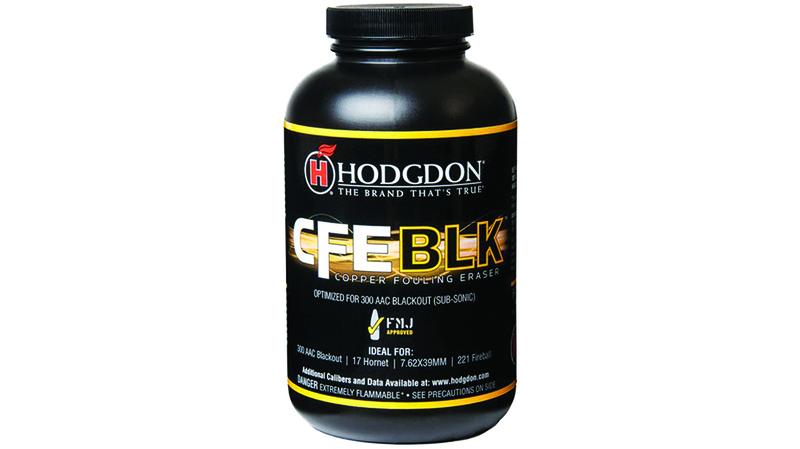 Hodgdon’s CFE BLK is formulated to load supers and sub-sonic loads for the 300 AAC Blackout. The DoubleStar AR was the test bed for CFE BLK powder, which should be a great performer in most 300 BLK ARs. 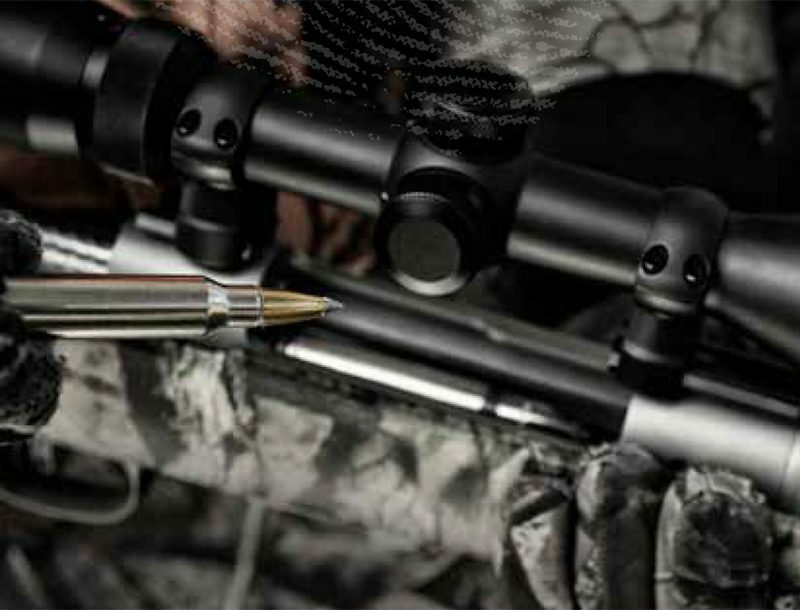 Popularity of the 300 AAC Blackout continues to track upward as Remington’s capacity to produce factory fodder caught up with demand for this reborn cartridge. Since the 300 Blackout’s production is still a fraction of 5.56 NATO ammunition, though, its price is relatively high in comparison. 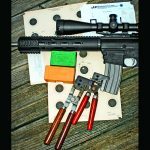 Handloading is a prime option to feed your 300 Blackout and save some money. To that end, we’re providing a few favorite loads you may wish to try yourself. Basically, the 300 AAC Blackout (300 BLK) is a .300 Whisper with a longer chamber throat lead. 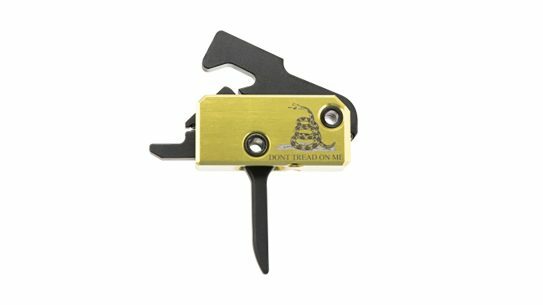 The .300 Whisper’s throat measures .050, while the 300 BLK measures .100 of an inch. The longer throat allows the safe use of trimmed and sized 5.56mm NATO brass without the malfunctions associated with thicker-walled brass. Finding cheap military 5.56mm NATO brass to cut down for 300 BLK ammo is much easier than necking up .221 Remington Fireball brass, too. Another issue associated with this cartridge is how much pressure is needed to cycle a direct gas impingement system without “over gassing.” This comes into play when considering the use of fast-burning powders that expend their gas energy in the first few inches of the barrel. 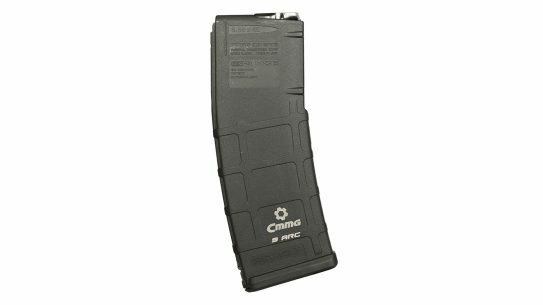 AAC’s thoughts on the matter center on using a non-adjustable carbine-position gas block, and finding powders that perform well with that gas block’s position. 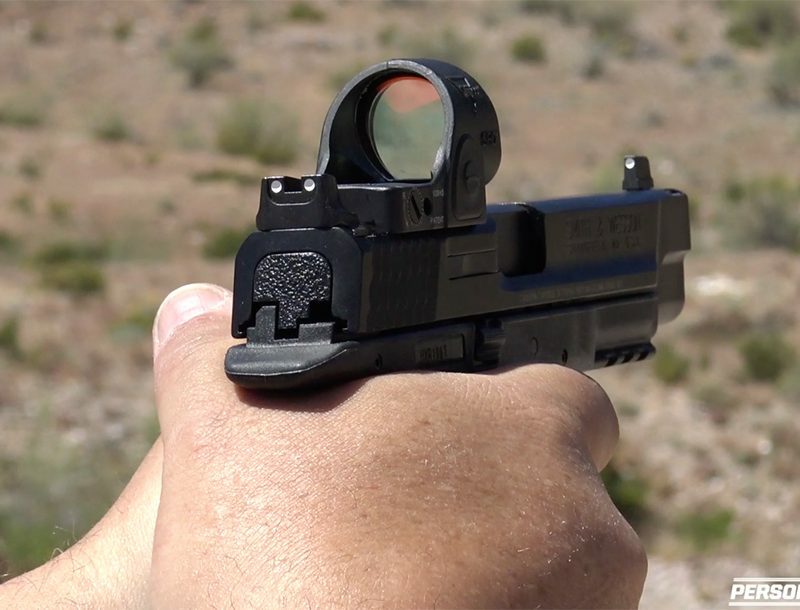 Other firearms manufacturers believe that an adjustable gas block at the carbine position will address the issue, while others believe that an adjustable gas block in the pistol position is the answer. 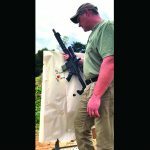 Other considerations come into play when loading for the 300 BLK. 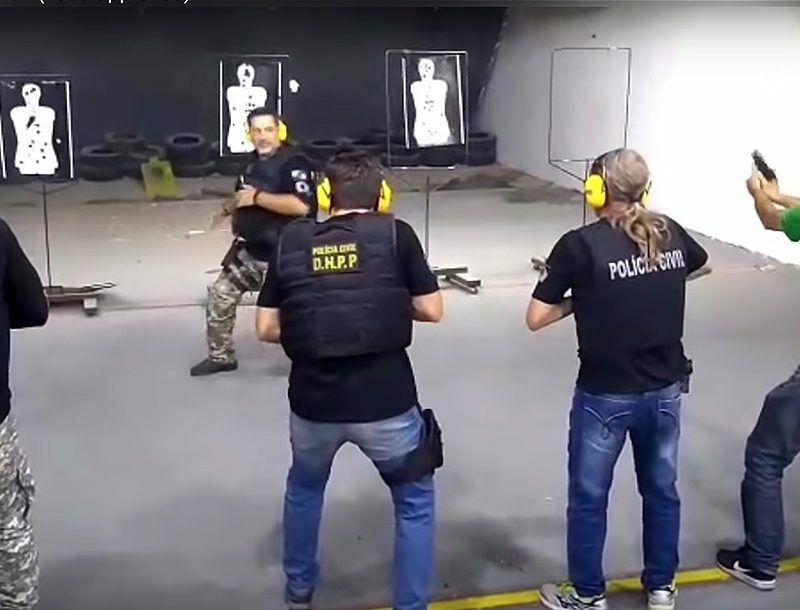 It’s not enough to keep velocities below the 1,080 fps threshold at sea level when loading subsonic rounds; they will still be too fast to keep noise at acceptable levels when using a suppressor. Loads need to average 100 fps slower to assure subsonic launch, and stay “whisper” quiet. I have learned that an adjustable gas block allows “tuning” the amount of gas that operates the weapon through extensive testing over the years, shooting 300 BLK from a DI AR. This comes in handy when switching from subsonics to high-velocity loads. Over the past several years I have worked up loads for no fewer than 10 different direct impingement ARs chambered in 300 Fireball/.300 Whisper/300 BLK. 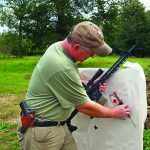 Every load and weapon combination won’t fit in the allotted space for this article, so I’ll focus on a select few loads from a couple of rifles. Now-defunct Loki Weapons Systems built a Patrol Rifle with an adjustable gas block in 300 BLK for an article I wrote several years ago. 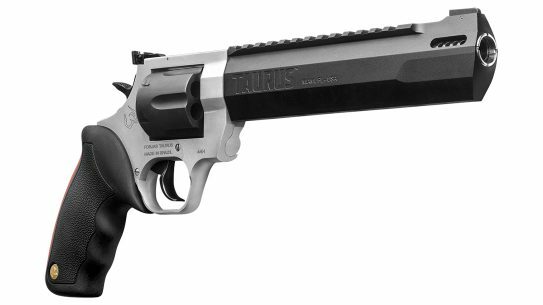 It was built with a Satern button-rifled barrel with the gas block in the carbine position. With select loads this rifle prints 0.75-MOA five-shot groups at 100 yards, so I added it to my collection. 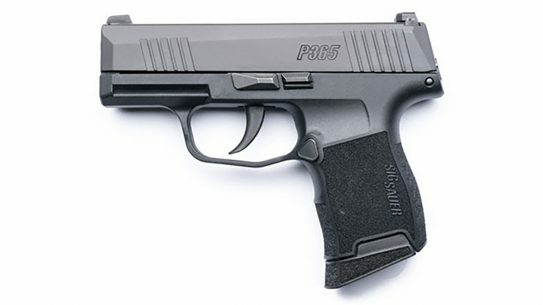 The powders used for this article didn’t show much difference between “pistol gas,” and “carbine gas.” In brief, the powders used for this article required the adjustable gas block screws to be turned out four full turns on the Loki to cycle subsonic loads. High-velocity loads cycled well with the gas screw turned out one full turn. 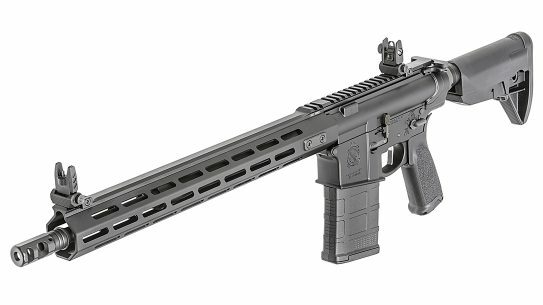 The latest 300 BLK carbine adding to my load database is a DoubleStar wearing a 16-inch barrel. 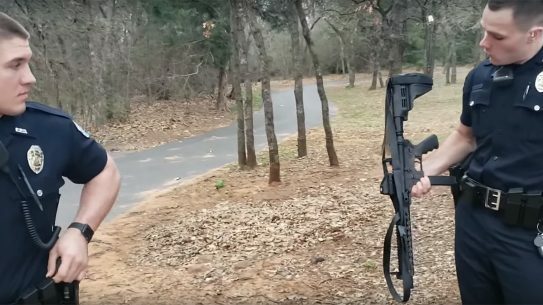 This rig sports a full-length skeletonized handguard and a minimalist buttstock. 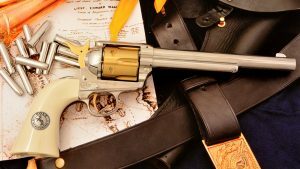 Of significance, the non-adjustable gas block resides in the pistol position on the barrel. 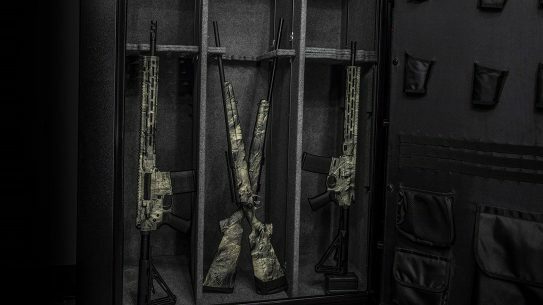 This carbine would be used to gather data on Hodgdon’s new CFE BLK powder, which is formulated specifically for 300 BLK subsonic loads. I loaded Accurate 1680, or Hodgdon’s H110 powder for quite a bit of my 300 BLK testing with the Loki. Cases were primed with Federal Small Rifle Benchrest primers. 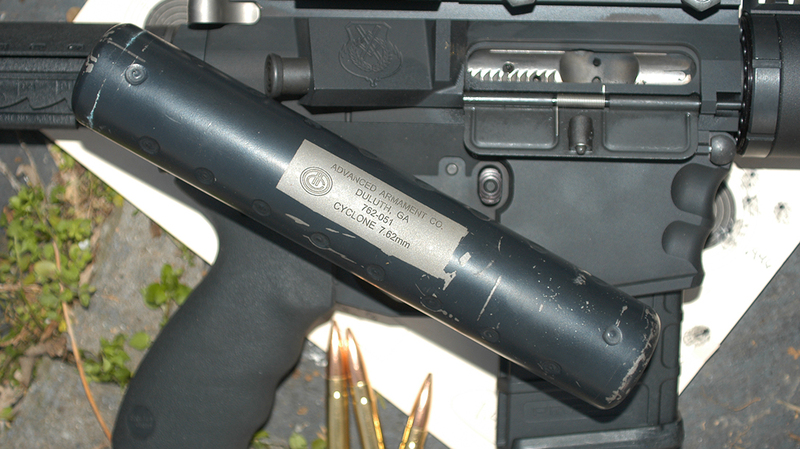 An AAC .30 caliber Cyclone suppressor was mounted for all testing, and an Oehler 35P chronograph recorded velocities. 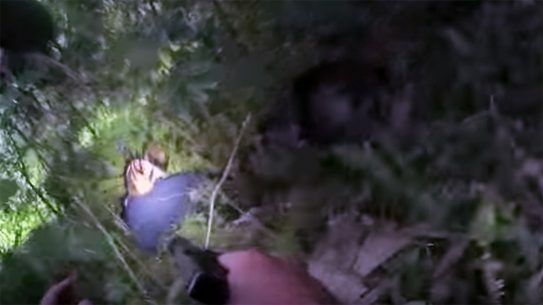 Shooting was conducted from a concrete reinforced bench, and five-shot groups were fired at 100 yards. The 220-grain Sierra Match King (SMK) is the gold standard in bullets for the BLK. 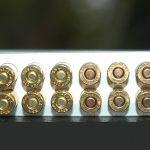 Most other bullets were seated just shy of the magazine’s maximum length, but a few bullet profiles had to be pushed past the ogive to improve feeding. The Loki’s adjustable gas block screw was typically turned out four full revolutions to allow enough gas to cycle and lock the bolt back on subsonic loads. Full-power loads cycled properly with the gas block screw turned out one full turn. The few loads listed in this article just scratch the surface of viable performers. Trying to match what I believe as a duplicate for Remington’s 220-grain factory load, I placed a SMK on top of 10.8 grains of Accurate 1680. I used trimmed and formed .223 brass. The average velocity was 992 fps, with standard deviation of 16 fps, and an extreme spread of 51 fps. The smallest group measured 0.753 inches, and the average for the first 10 groups was 1.213 inches. 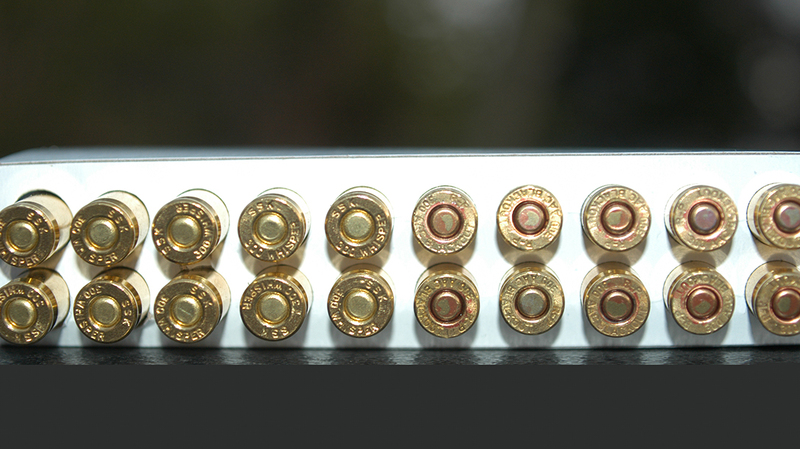 Sierra Match King 210-grain bullets on top of 9.2 grains of H110 averaged 1,025 fps. The ES was 44 fps, and the SD was 19 fps. The smallest group was 0.998, with the average measuring 1.44 inch. The 210-grain SMK loaded on top of 10.8 grains of A1680 averaged 1,009 fps, and the SD was 19 fps. The smallest group measured 0.976, and the average went 1.768 inch. 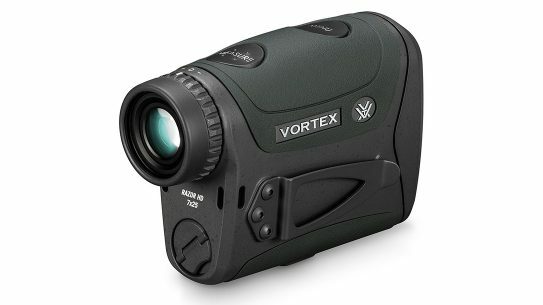 The 210-grain Berger VLD’s on top of 10.5 grains of A1680 averaged 2.09 inches, with the tightest measuring 1.766. Average velocity was 922 fps. The SD measured 19 fps, while the ES was 63 fps. Hornady’s 208-grain AMax on top of 10.8 grains of 1680 averaged 994 fps. The ES was 115 fps, and the SD was 34. The average group size measured 1.75 inch, while the tightest was 1.697 inch. One of the tricks I’ve been taught when loading the AMax for subsonic loads is to pull the plastic tips out of the bullet to allow seating the bullet out further, as well as improving its terminal shock force. The Hornady 208-grain AMax and 9.4 grains of H110 was a tad too fast. 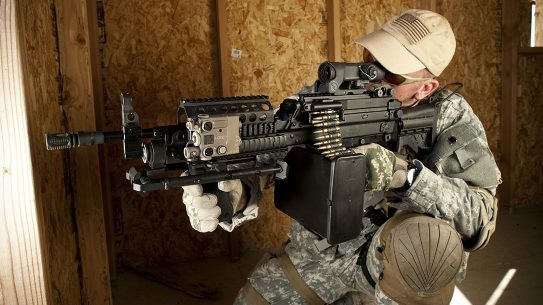 The average velocity was 1,069 fps, but the load’s extreme spread of 96 fps put a few rounds above the sound barrier. The average group size measured 2.21 inches, with the smallest at 1.039 inch. Hornady 155-grain AMax loaded to an average of 1,960 fps, and the SD was 19 fps. Groups averaged 1.786 inch. The smallest group measured 0.899. I really like the idea of shooting heavy cast bullet loads in 300 BLK, owing to the economy they provide. Factory bullets cost between 30 and 45 cents each, but I have nearly five tons of smelted wheel weights that I can turn into projectiles. Since my casting equipment has long since recovered its initial startup cost, and my lead didn’t cost any more than the fuel to drive my truck to pick them up and smelt them, my final cost is about two cents per round. I’ve included two loads here. The first load consisted of a 200-grain RCBS silhouette bullet that consisted of a 3:1 ratio of clip-on wheel weights and pure lead. The actual weight was 208 grains, and they were sized .309. Averaging 1,009 fps from a charge of 10.2 grains of A1680, the average group size measured 2.1 inches. The tightest group measured 0.998-inch from the Loki. The standard deviation of 19 fps made this an excellent cast bullet load. Lyman’s 210-grain round nose mould produces a final weight of 212 grains with an alloy of three parts pure lead and one part clip-on wheel weights. 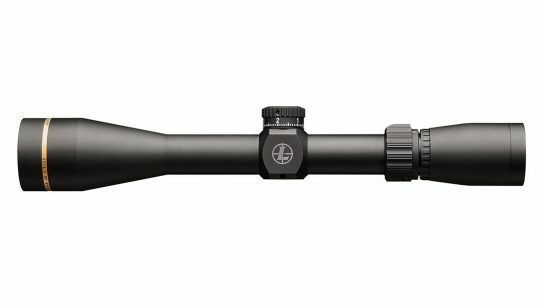 The same 10.2 grains of A1680 averaged 978 fps from the Loki. The smallest group was 1.123-inch, with the average just under 2 MOA. 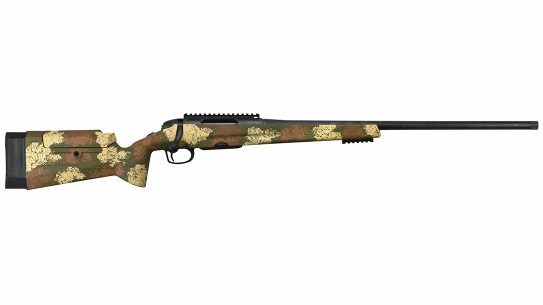 Jumping over to the DoubleStar and Hodgdon’s new CFE BLK powder, I worked up a load for the 110-grain Barnes TTSX, which is a dandy whitetail and hog bullet. I settled on 23.5 grains of CFE BLK, which produced 2,280 fps average velocity with an SD of 18 fps. The best group measured 0.890, while the average hovered around MOA. Moving to subsonics, I loaded 11.5 grains of CFE BLK to get an average velocity of 1,016 fps. An SD of 20 fps and acceptable extreme spread kept the bullets subsonic in 80-degree weather. I’ve had this rifle shoot rather tight groups with this bullet at 100 yards with other powders, but it leaves evidence of wobble on targets. It will leave tear patterns in the target that indicate an unstable bullet, and shooting with this powder proved no different. At 200 yards, groups open up and I’ve had a few keyhole. Even so, I was able to shoot a 1.125-inch group at 100 yards. Stepping up to the 220-grain Sierra Match King, I found a sweet spot with 11.9 grains of powder. It averaged 982 fps, which seems to be a threshold for truly quiet suppressed loads. And, it continued to cycle the action reliably. The SD was 14 fps, which helped the load print MOA groups. The tightest measured 0.890 inch. 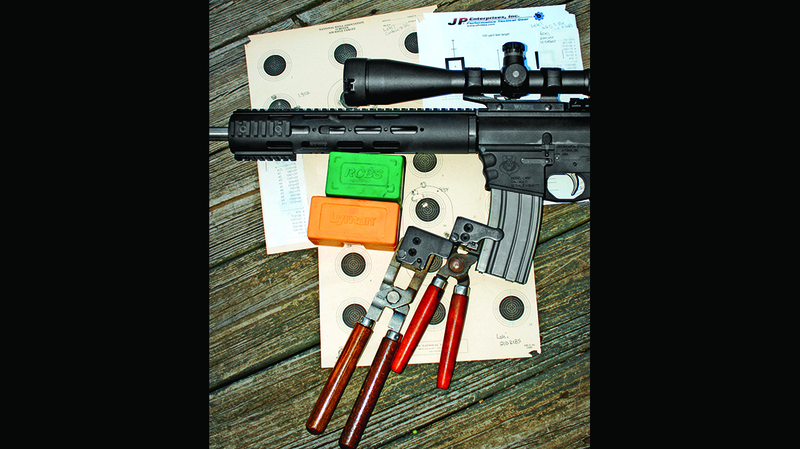 Reloading for the 300 BLK is easy and enjoyable. Additional loads are listed in the chart below, so check them out, too. *Velocities determined with an Oehler 35P chronograph 10 feet from the muzzle. Smallest five-shot groups at 100 yards, measured in inches. Standard deviation of loads was rounded to the nearest whole number, and average velocity was for 10 shots. All testing was conducted with an AAC Cyclone suppressor in place. *Velocities determined with an Oehler 35P chronograph 10 feet from the muzzle. Smallest five-shot groups at 100 yards, measured in inches. Standard deviation of loads was rounded to the nearest whole number, and average velocity was for 10 shots. All testing was conducted with an AAC Cyclone suppressor in place. 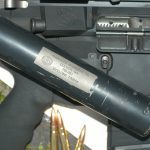 Average velocity from Delta Company Arms AR upper. 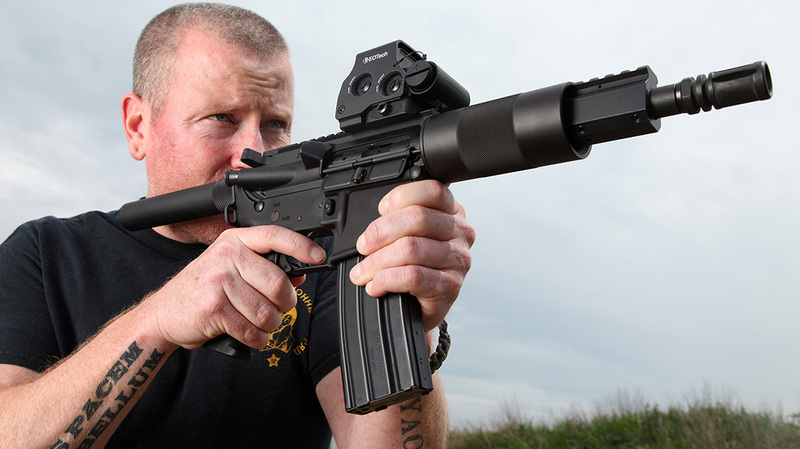 AAC’s barrel produced an average of 1,114 fps, which is supersonic.